Onnoghen’s legal team at the Code of Conduct Tribunal. 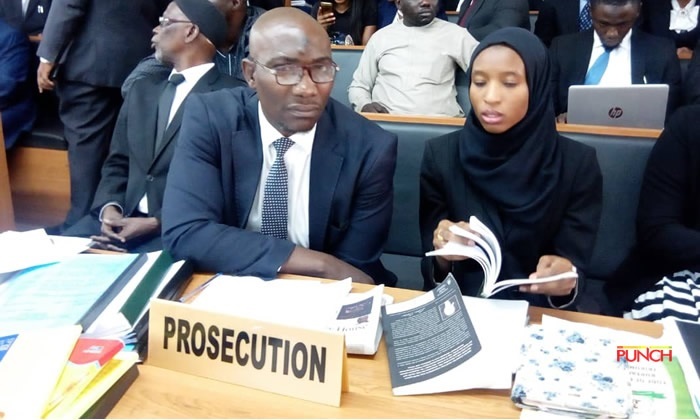 Danladi Umar, chairman of the Code of Conduct Tribunal (CCT), accused the Adeboyega Awomolo, SAN, counsel to Walter Onnoghen, suspended chief justice of Nigeria (CJN), of applying delay tactics to stall proceedings. Umar made the accusation at the resumption of hearing on the case against Onnoghen on Monday. Awomolo had applied for an adjournment till Thursday because of a petition submitted to the National Judicial Council (NJC) against his client. Aliyu Umar, counsel to the federal government, agreed to the adjournment but the CCT chairman said since the matter has been slated for hearing both lawyers “must” move their applications already pending before the court. “That [petition against Onnoghen at NJC] has nothing to do with the tribunal,” the CCT chairman said. At the point, Awomolo was visibly angry. He said in his over 40 years at the bar, he has never done such. The FG counsel intervened and asked that the tribunal is stood down for 30 minutes. The CCT has adjourned to 13th February 2019 for hearing of application, insisting Justice Walter Onnoghen must be present to take his plea before any preliminary objection to the competence or jurisdiction of the trial can be raised. 11: 17 am: After tensed arguments and emotions between Defence Counsel Adegboyega Awomolo and CCT Chair Danladi Umar on whether to take applications or not, CCT adjourns to Feb. 14. Both parties later apologised after a 30mins break. 11; 15 am; Prosecutor Umar says “But if on Thursday Onnoghen does not come to court, I will ask for the appropriate orders against him.” Eg Bench Warrant of Arrest on Onnoghen. 11: 13 am; Awomolo says no harm would be done to all parties if case is adjourned until the outcome of the NJC. Prosecution Counsel Aliyu Umar agrees to the application. 11:09 am; Defence Counsel Adegboyega Awomolo says the same petition against CJN Walter Onnoghen sent to Code of Conduct Tribunal has now been forwarded to NJC for investigation by the AGF. He is asking for an adjournment pending the 09 the out come. 11: 00am The trial of Nigeria’s suspended Chief Justice, Walter Onnoghen has resumed at a special court for trying assets declaration cases in Abuja. TheNigerialawyer reports that the Onnoghen is once more absent.